The 2006 IANDS conference was hosted by The University of Texas M. D. Anderson Center in Houston, Texas. The conference reviewed 30 years of research into NDEs, spanning the field of near-death studies that began in 1975 with the book Life after Life by Raymond Moody, MD, PhD. To order DVDs, CDs or audio downloads for the conference presentations, please click on the links below. Segment One - The First Two Days: DVDs are available for the eleven presentations from the first two days of the conference. These DVDs, featuring many of the world's foremost NDE researchers, represent a comprehensive review of all research on NDEs. They are a unique collection that represents the accumulated knowledge that we have about near-death experiences. Each DVD incorporates the visual slides that were used by the presenters. CDs and audio downloads are also available for these presentations. Segment Two: The Last Two Days: The presentations during the latter two days of the conference, for which only CDs and audio downloads are available, build on the presentations during the first two days. The sessions probe deeper into specific topics through a variety of lectures and panels of experiencers discussing their experiences--most notably childhood NDEs and those resulting from combat or suicide attempts--and the effects of NDEs on marriages. 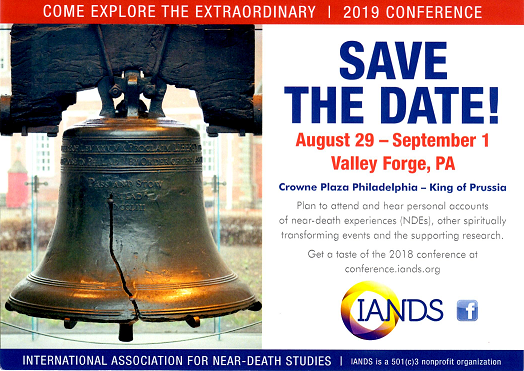 To join IANDS to support our mission of research, education and support, and to take advantage of the member discounts, click here. The Handbook of Near-Death Experiences: Thirty Years of Investigation, a careful overview of published studies about NDEs, is now available from your favorite book distributor. Published by Praeger, the book is built around presentations from the first two days of the 2006 IANDS conference. That event at The University of Texas M. D. Anderson Cancer Center in Houston brought together NDE researchers from around the world to discuss the major findings of three decades of exploration into NDEs. The result is this scholarly Handbook of Near-Death Experiences, edited by Janice Miner Holden, EdD; Bruce Greyson, MD; and Debbie James, RN/MSN. This unique set of eleven DVDs are all the presentations from the first 2 days of the 2006 IANDS Conference and represent a comprehensive review of all of the research on NDEs through 2005. Order this one CD with all 25 presentations that were recorded (all four days) from the 2006 conference as MP3 files. Listen to them in your car (most newer cars have MP3 compatible CD players) , on your computer, or download them to an iPod or other MP3 player. Below you may order CDs and audio downloads of individual presentations from the 2006 conference. A number of handouts from the conference presentations are available at the bottom of this list or on this separate page. Is there a biological basis for the near-death experiences? This is one of the core issues that much of the research into NDEs seeks to answer. In this presentation, Dr. Bruce Greyson, prominent among the world’s NDE researchers and long-time editor of the Journal of Near-Death Studies, reviews each of the major physiological theories about NDEs, countering them with research data that refutes them as explanatory models. Following an analysis of contemporary NDE-related neurological research, Dr. Greyson concludes with an overview of the unique features of NDEs and why none of the physiological models is adequate to explain them, including the question of whether the brain creates consciousness or merely mediates an independent consciousness. Drawing on the results of 42 research studies on adult near-death experiences in Western cultures, this presentation offers one of the best overviews of this phenomenon. Using Dr. Kenneth Ring's paradigm that outlines five main stages of NDEs, Dr. Scott Taylor reviews in-depth the characteristics of each stage, citing examples of experiencer interviews to highlight key facets of the experience. Dr. Pim van Lommel continues the presentation with a detailed look at the correlation of demographics on the frequency and type of NDEs (age, gender, etc. ), including the effects of psychographic and medical circumstances. The presentation concludes in the question and answer period with a moving, personal account by Dr. Taylor of his empathic NDE, an unusual but powerful type of experience. Many people who have an NDE, especially children, have a crisis following their near-death experience that can either lead to growth or to depression and self-repression. Ideally, the NDE may resolve itself as a death/rebirth awakening to greater life. Using the IANDS Index to Periodical Literature from 1976-2006 and Dr. Rozan Christian's research, Dr. Russell Noyes narrates both positive and challenging life changes after an NDE, and how they might be integrated over time as near-death experiencers reconfigure everyday life and relationships to match their spiritual awakenings. In closing remarks, Dr. Peter Fenwick discusses how the NDE has shaken the foundations of psychiatry and medicine in America and the United Kingdom, sparking a Copernican-like debate about the nature of reality. In a surprising review of 30 years of major NDE studies, Nancy Evans Bush overturns the perception that distressing NDEs are rare and addresses inevitable questions about them: Are they true NDEs? How common are they? Why do some people have them? What do they mean? Noting the almost universal avoidance of these troubling experiences, she observes the absence of any evidence that “good people have good experiences and bad people have bad experiences,” and suggests other questions whose answers would increase the likelihood of dealing constructively with distressing NDEs. Richly illustrated with the words of childhood and teen experiencers, Dr. Cherie Sutherland gives a moving and powerful talk about the nature, content and aftereffects of young people's NDEs. Providing evidence that age, circumstance, or brain development have no effect on the content or complexity of the near-death experience in children and teens, she offers a rich tapestry of the unique challenges that children and teen experiencers face, growing up transformed and often at odds with their parents' and traditional religions' beliefs about God and death. Dr. Sutherland concludes with suggestions for how medical personnel and family members can help the young person, and also evidence that these experiences are therapeutic for bereaved parents. In Western countries, are there any characteristics of individuals that predispose them to have NDEs during a life-threatening event? Are there any characteristics of near-death experiencers (NDErs) that modifies significantly the content of their NDEs? Answers to these important questions are vital in the quest to better understand NDEs. In this presentation, Dr. Jeffrey Long and Dr. Jason MacLurg review 30 years of research into the characteristics of NDErs from Western countries to examine how culture, personal characteristics and belief systems might affect the incidence and content of NDEs. This is a critical aspect of NDE research if we are to understand the elements of the experience, including what appear to be symbolic motifs and unusual sensory experiences that are part of many accounts. One of the most fascinating aspects of NDEs is "veridical perception," in which the near-death experiencer reports seeing or hearing events during their NDEs that, given the condition and/or position of their physical bodies, should have been impossible to perceive but are nevertheless corroborated as accurate. Because this phenomenon should be an impossibility given our current understanding of how the brain functions, it has aroused intense controversy and interest. In this presentation, Dr. Jan Holden from the University of North Texas reviews decades of research into this phenomenon. She surveys over 100 instances of possible veridical perception in the research literature. The startling result is that the vast majority of these cases were shown to be accurate. Delving deeper, Dr. Holden analyzes in great detail a few of the most interesting cases. She then reviews the hospital studies that have attempted to capture veridical perception under scientifically controlled conditions, all of which have been unsuccessful so far. She concludes by discussing the controversy that continues to swirl around this phenomenon. NDErs sometimes report the perception of events during their NDEs that appears to have been impossible considering the location and/or condition of their physical bodies and yet is later corroborated as accurate. After Dr. Holden summarizes research that provides a rationale for pursuing veridical perception research in the hospital setting, Dr. Fenwick describes his hospital veridical perception research procedures and findings with Dr. Sam Parnia in the U.K., and Drs. Greyson and Holden describe theirs in the U.S.
Dr. Sartori describes a five-year prospective research project of hospital NDEs and OBEs that she conducted in Wales. Results of the study include the frequency of NDEs / OBEs and a comparison of two patient samples. Patient testimonies are used to compare case reports of hallucinations with NDEs. Dr. Kircher begins her session with a list of factors leading to increased numbers of reported NDEs and subsequently examines changes that have taken place in the last 30 years regarding the NDE. Additionally, she identifies three different aspects of medicine that support the concept that consciousness is nonlocal. She concludes with four factors leading to increased knowledge about NDEs among health care professionals. In many medical settings, death is considered the enemy – or professional defeat. What ethical and practical implications does this hold for the care of near-death experiencers? Presenters Diane Corcoran and Debbie James, two nurses long involved in the care of near-death experiencers and nationally recognized Nursing Speakers, review 30 years of literature on this subject. They concentrate on the subject of nursing education but touch on issues relating to mental health and pastoral counseling as well. Given the frequency of NDEs occurring in critical care hospital environments, the presenters lay out a road map of what needs to be done for the training of all types of health care professionals with particular emphasis on ethical implications and practical applications for palliative and end-of-life care. Dr. van Lommel discusses new hypotheses that could explain the several universally reported elements of an NDE with non-local interconnected fields of consciousness. According to this concept, humans can conclude that our consciousness could be based on fields of information, consisting of waves, and that it originates in a higher dimensional phase-space. Is there a "core" near-death experience that encompasses Western and non-technological societies? For the past 30 years numerous studies have been made of Western near-death experiences, their aftereffects and implications. Some researchers claim there is a "core" experience that is part of mankind's spiritual heritage. In this presentation, Dr. Allan Kellehear, an Australian sociologist and director of palliative care, delivers a challenge to the assumptions drawn by white, Anglo-European cultures with his survey of non-Western accounts, including numerous studies of hunter-gatherers and Pacific islanders, as well as the growing literature on Asian experiences. Dr. Kellehear analyzes all accounts of non-Western near-death experiences published through 2005 to determine what, if any, features appear to be universal. The features he examines are the tunnel, the out-of-body experience, the life review, and the presence of supernatural beings and a supernatural world. He concludes that some features seem cross-cultural, some appear to be culture-specific, and, in some cases, the question of universality of the feature remains ambiguous. Are there elements of the NDE in the major world religions that are reflected in their descriptions of the afterlife, the ultimate deity, if any, and values that match the character transformation of near-death experiencers? What are the common threads between the world religions and how can we bridge the gap that separates them from each other? Farnáz. Ma'sumián, from the University of Texas and author of Life after Death: A Study of the Afterlife in World Religions (2002), takes us on a journey through four millennia of the sacred writings, beliefs and values of seven world religions – Hinduism, Buddhism, Zoroastrianism, Judaism, Christianity, Islam, and the Baha'i faith – and what insights the NDE can offer on their theology and practice. This panel of experienced NDEr caregivers will discuss challenges caregivers face while caring for a patient or client after an NDE. They will then describe practical and ethical interventions for a caregiver to consider including in an NDEr’s Plan of Care. Exploring the impact of the aftereffect of NDEs on the marriages of experiencers, Dr. Christian summarizes the findings from her first-ever empirical investigation of the incidence and dynamics of intact marriage or divorce following the NDE of one of the spouses. For the panel discussion, intact couples and divorced (and sometimes remarried) NDErs describe their marital experiences subsequent to their NDEs. Dr. Christian and panelists draw comparisons between panelists’ testimonials and Dr. Christian’s research results. Dr. Corcoran facilitates discussion between individuals who came to have their NDE through combat. She describes the NDE environment in the military as well as current NDE resources available in the military. The panel explores recommendations to improve care during and after combat. Some of the most frequently asked question regarding near-death experiences concerns suicide. What are the NDEs like of those who have attempted suicide but survived? Can knowledge of the NDE play a role in suicide prevention? Dr. Greyson facilitates a panel discussion of individuals who are survivors of a suicide attempt during which they had an NDE. After the panelists shared their experiences, they discussed the impact of the NDE on their lives. Dr. Kircher facilitates a panel of individuals who had near-death experiences as children. She explores how the NDE has been integrated into their lives and what challenges they have encountered. She also notes differences between NDEs in children and adults, thus suggesting potential interventions for care of both populations. Veridical perception refers to NDErs’ reports of perception during their NDEs that appears to have been impossible considering the location and/or condition of the NDEr’s physical body and yet is later corroborated as accurate. In this panel leading researchers in the phenomenon of veridical perception describe and compare their views about the best model for future veridical perception research. This presentation briefly begins with an introduction to the entire 2006 IANDS conference, laying out what will be covered in the following days. With the introduction of Dr. Bruce Greyson from the University of Virginia, the presentation moves into the heart of the content. Dr. Greyson summarizes major developments in the first 30 years of near-death studies, including a discussion of pioneers in the field, websites and publications. He reviews research papers and books that drew on the accounts of 2,500 near-death experiencers, and concludes by defining and contrasting retrospective versus prospective studies - and how each has affected the field. Dr. Jan Holden from the University of North Texas continues with an analysis of the controversy surrounding this field of research, using Dr. Ken Wilber's Integral Theory to understand why such intense controversy exists. Debbie James, RN, from the University of Texas M. D. Anderson Cancer Center concludes the presentation with an overview of the ethical implications for the care of near-death experiencers. It is recommended that this DVD be purchased if one is obtaining most or all of the DVDs from this conference as it will help to establish the context for the other presentations. Mr. Guggenheim describes the results of his 7-year study of After-Death Communications (ADCs) based on over 3,000 first-hand accounts provided by over 2,000 research participants. He discusses the implications of his findings for palliative and end-of-life caregivers and for healthcare professionals working with those who are grieving. Dr. Wilkinson describes the components in a therapeutic liaison. She also discusses self-disclosure as therapeutic use of self regarding NDE. She includes how such interventions may improve care of those healing as well as dying. Advances in psychiatric diagnosis enable the differentiation of the NDE and other transpersonal experiences from mental illness. Although the NDE and other transpersonal experiences do not prove the existence of a personal God and afterlife, they definitely point to it. Research into the aftereffects of the NDE and other transpersonal experiences document positive changes in the areas of spirituality and well-being. Ms. Elsaesser-Valarino discusses how the NDE can bring comfort to the terminally ill, the dying, and the bereaved. She also describes the impact of the NDE, Nearing Death Awareness (NDA), and After Death Communication (ADC) on grief and bereavement through the use of case studies. The session concludes with considerations for caregivers. Drawing on decades of experience both organizing and observing successful support groups of NDErs, Ms. Sharp describes how to develop such a group and discusses the benefits and challenges of continued momentum of an NDE support network. After explaining the phenomenon of REM intrusion and providing an overview of Dr. Kevin Nelson et al.’s recent Nature article on NDEs and REM intrusion, the presenters critique Nelson et al.’s research methodology, findings, and conclusions. The presenters conclude with recommendations for future research on the possible relationship between NDEs and REM intrusion. Dr. Kelly, a mental health clinician for 30 years that included specialized services to emergency service workers and medical personnel, reviews research on the prevalence of reports by police of possible post-mortem contact at the sites of accidents and health emergencies. He concludes the session by recommending certain care considerations for emergency responders who report these experiences. Two near-death experiencers (NDErs) share what happened to them after their NDE when they described their experience to doctors, nurses and others immediately after their NDE. Long-time nursing educators Diane Corcoran and Debbie James follow this up with a discussion of the importance of an NDEr’s disclosure of their experience, the reasons an NDEr might not disclose, and strategies for healthcare providers to facilitate and respond constructively and ethically to the disclosure of an NDE. Who in the World is Interested in NDEs? Dr. Atwater shares insights she has gained from 28 years of travel and speaking to audiences throughout the world on the Near-Death Experience. She compares cultural differences she has noted regarding the very topic of the NDE as well as a myrid of responses she has received through her presentations about the phenomenon. She concludes with several considerations for healthcare providers who intervene with a near-death survivor. Dr. Horacek discusses how the NDE might point to the possibility that consciousness continues to exist after one dies. He also notes how the NDE may reduce death anxiety and suggests that a reunion might await the griever and the deceased loved one. He closes with thoughts regarding an increased communication between those who are dying and their loved ones. Dr. Peralta calls upon his many years in the field of Hospice and Palliative Care to look at the stages, as well as the physical and spiritual signs and symptoms, of dying. He compares and contrasts Erik Erikson’s adolescent psychosocial moratorium to a proposed psycho-spiritual moratorium. He concludes with an exploration of the potential therapeutic use of symbolic images in understanding the myth of death. Dr. Rozan Christian is a Texas Licensed Professional Counselor who has been trained to facilitate induced after-death communication (IADC®) sessions. She received her training from Allan L. Botkin, Psy.D., the individual who developed this approach. Rozan will donate one IADC session, which she will conduct Sunday morning, October 29, 2006 at a location to be determined, probably a private room in the conference hotel. The session will be 60-90 minutes in duration. Rozan makes no guarantees that the participant will experience communication with the deceased loved one. However, individuals who have successfully experienced an after-death communication have been willing to experience the sadness they feel for the loss of their loved one and be able to maintain an open and receptive mind throughout the process. If you have any questions about IADCs, Rozan will be available at the conference to discuss the process with you. Also, if you have received a serious psychiatric diagnosis, please talk to her ahead of time at the conference so she can determine if you would be a good candidate for participating in an IADC session. Rozan will meet with the winner of this silent auction item at the Celebration/Party Saturday evening, October 28, to gather general information to help facilitate a more relaxed, open session on Sunday morning. Note that these are presentations made by individuals at an IANDS conference, and do not necessarily represent the views of the IANDS organization.